Ips bark beetles (Ips pini), also known as the pine engraver, is an insect that attacks and kills weak, stressed, declining and dying pine and spruce trees. These insects are attracted to trees that have been stressed from drought, construction damage, overcrowding, transplant shock, flooding, disease and other insect problems (e.g., root collar weevil). 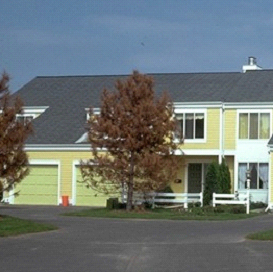 Healthy trees are typically less attractive to Ips bark beetle and can fend off attack. However, even healthy trees can be overwhelmed and killed by high Ips bark beetle populations. High levels of Ips bark beetle can contribute to the rapid death of pine and spruce trees. Appearance: Adult Ips bark beetles are small (⅛ to 3⁄16 inches long), cylindrical and brown (see photo). Ips bark beetle eggs are very small (approximately the size of a pinhead), oval and pearly-white. Resulting larvae are legless, creamy-white with a brown head, and eventually grow approximately 3⁄16 inches long. Symptoms and Effects: The initial indication of an Ips bark beetle problem is yellowing or browning of needles on infested trees. Upon closer inspection, numerous small, round emergence holes (approximately ⅛ inch in diameter) will be visible on the tree trunks. Reddish dust (the result of the beetle’s boring activities) may be visible at the base of affected trees. If bark near emergence holes is removed, a network of tunnels will be visible in the wood underneath. Oftentimes the wood surrounding the tunnels is blue-grey in color due to colonization by certain fungi (typically species of Ceratocystis). Typically, once needles start to discolor, infested trees cannot be saved and will eventually die. Life Cycle: Adult Ips bark beetles spend the winter in needle litter on the ground, and under the bark of infested trees. Male beetles become active in early spring and tunnel into weak or stressed trees. Female beetles are attracted to these trees and, after mating, bore tunnels that are Y- or H-shaped, laying eggs as they tunnel. Larvae emerge from the eggs and bore tunnels at right angles to the main tunnels produced by the females. Larvae eventually pupate in the tunnels, and the adults that hatch from the pupae bore to the bark surface and emerge to begin the life cycle anew. In a typical Wisconsin summer, Ips bark beetles are able to complete two life cycles. Cultural: The best way to avoid problems with Ips bark beetle is to promote strong, healthy trees and shrubs. Select proper planting sites for trees and shrubs, and water transplants regularly, making sure that they do not dry out completely. Also be sure to water established trees and shrubs during periods of drought. Mulch around trees and shrubs (out to at least the dripline) using up to three to four inches of mulch (depending on soil type), but keep the mulch from coming into contact with tree trunks and shrub crowns. DO NOT fertilize trees and shrubs until they have been planted for at least two growing seasons. Also, avoid root injuries and soil compaction. In large plantings, thin trees as they mature to lessen competition and promote growth of the remaining trees. Healthy trees are not attractive to Ips bark beetles and can defend themselves by preventing successful tunneling. 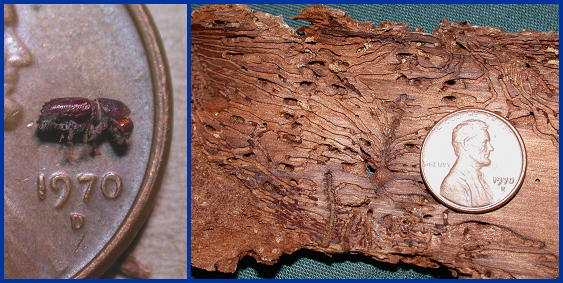 Adult Ips bark beetles are small, cylindrical, brown insects (left), and damage trees by producing an extensive network of feeding tunnels (right). Trees infested with Ips bark beetles should be cut down, and any green, woody material from the trees debarked, chipped or burned to kill bark beetle larvae and to eliminate potential breeding sites. DO NOT compost any materials from Ips bark beetle-infested trees. Freshly cut branches from pruning or thinning also should be destroyed by chipping or burning. Chemical: Insecticides containing bifenthrin, carbaryl (Sevin®), or permethrin can be used as preventive sprays. These insecticides should be applied to trunks and larger branches of susceptible trees. Because of the extended period of activity of Ips bark beetles, two sprays (one in mid-April to early May, and a second in late June to July) may be needed to protect trees, particularly when beetle populations are high or when trees are under severe stress. As an alternative to spray treatments, systemic products containing clothionidin, dinotefuran, imidacloprid, or thiamethoxam may be applied as drenches in the root zones of susceptible trees. Systemic products should be applied in early spring (April) when the soil is no longer frozen and root absorption is most likely to occur. Be sure to carefully read and following the instructions on the label of whatever product you select. Insecticide rates for control of Ips bark beetle are often higher than those used to control other insect pests. For more information on Ips bark beetle: Contact your county Extension agent. Thanks to Laura Jull, Barb Larson, and Judy Reith-Rozelle for reviewing this document.